Babies are so unpredictable. You put them down in one place, you never know if they’ll be there when you come back. And don’t even get us started on kids and teens. Artists have it particularly rough with volatile young people, because their facial expressions are just as fleeting. Happy one minute, sad the next. Puzzled for a second, then astounded. 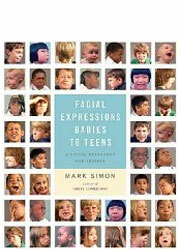 Facial Expressions Babies to Teens solves the artists’ problems with a dazzling array of more than 2,500 photographs of fifty babies, kids, and teens demonstrating every human emotion through facial expression. Artists, animators, cartoonists – everyone who needs to capture any look from babyhood to age 19 must have a copy of this fascinating reference. With extra sections on anatomy, hats, and close-ups of phonemes, plus a remarkable age-progression gallery, Facial Expressions Babies to Teens is the only book an artist can really depend on. And we promise it will stay right where you put it, every time.